Moon Dough is hypo allergenic no wheat dough and it never dries up! 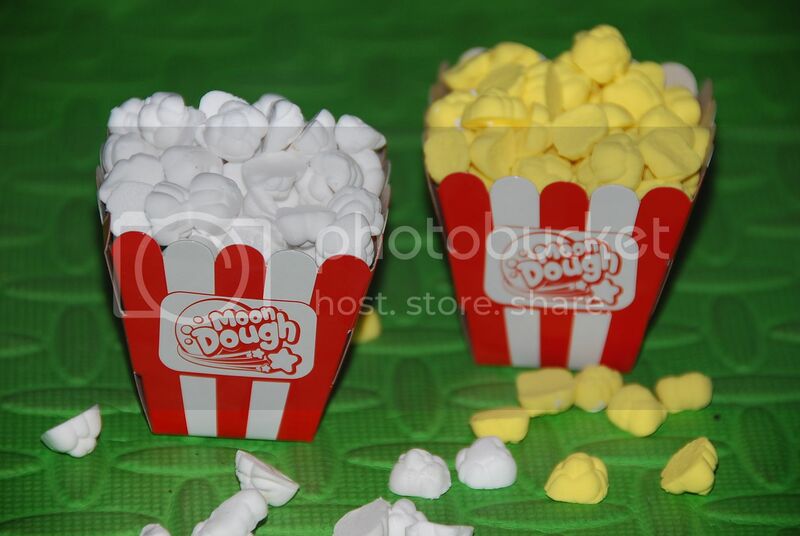 The box that was given to us for review is Moon Dough Snack Shop. The box contain 3 blocks of moon dough (yellow, white and brown), a snack maker (ice cream and pop corn maker) and a pretzel maker. It also comes with ice cream cones and popcorn tumblers and a popcorn scoop. From a mom’s point of view, anything that can keep the kids busy and happy, I am all for it. Seeing them play with the Moon Dough, making popcorn and ice cream, for hours is the reason why this is our product of the week. I just have to add that the popcorn maker is really cute, makes popcorn that looks so real! My first born, being the most vocal has a say on Moon dough, it does not dries up according to him and not sticky to the hands. My second born who hates anything that has a strong smell, approves the mild smelling dough. All of them agreed that this is one of the best toy mom brought home. And all of them wants to make popcorn everyday! As it is with any other dough, some parts tend to fall out, if you have noticed our rubber mat full of small whiteys, that’s Moon Dough, but since the dough never dries out, it’s easy to pick the fall outs and put it back to the bigger dough. Moon Dough is exclusively distributed by Richwell Trading Corporation. Available in leading toy stores and department stores nationwide. For more information about other Richwell products, visit www.richwell.net or call Richwell Trading Corporation at telephone numbers 732-5141 to 47 loc 211. Every Wednesday I post about products that I have tried and loved.. If you want your products here, contact us and we’ll take a look on it.